The Swansboro Christmas Flotilla is a time-honored tradition and fun for the whole family! At dusk, on the Friday after Thanksgiving, gather along Swansboro’s waterfront and watch the spectacular parade of lights down the White Oak River. Music will fill the air and you can enjoy treats, such as funnel cakes, cider and hot cocoa as you enjoy the lights glimmering off the river. 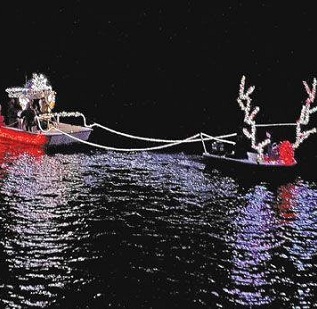 You’ll be amazed by the lights and décor of the boats and you might even catch a glimpse of Santa Claus!